A small Italian village actually got the better of robbers who thought they were stealing a genuine painting by a Flemish master worth millions of dollars. Brueghel’s “The Crucifixion (1617). Courtesy photo. It sounds like the plot to a madcap movie – “Entrapment” by way of Will Ferrell and Mark Wahlberg, perhaps – but a small Italian village actually got the better of robbers who thought they were stealing a genuine painting by a Flemish master worth millions of dollars. “The Crucifixion,” by Pieter Brueghel the Younger, hangs in the Santa Maria Maddalana church in Castelnuovo Magra. It was donated to the church over a century ago, and was stolen once before in 1981. In February of this year, local authorities got wind of a plot to steal the painting again, and they concocted a scheme of their own. The Local Italy reports that the original painting was removed to a secret location in the town, and a copy was put up in its place. Surveillance cameras were also installed. Sure enough, on the morning of March 13, the display case in the church was broken with a hammer and two men were caught on camera removing the painting and driving off in a white Peugeot. The church does have an alarm system, but it’s not clear that it went off during the theft, according to The New York Times. The Rev. Alessandro Chiantaretto, the priest of Santa Maria Maddalana, told the Times that he believed the thieves “must have studied my habits,” and knew that he’d be away from the church ministering to housebound parishioners at the time the theft occurred. Daniele Montebello, the mayor of Castelnuovo Magra, told journalists that the painting was “a work of inestimable value, a hard blow for our community.” But that night, Montebello revealed he had been feigning his sadness and shock, and was in on the scheme to defraud the thieves the entire time. Police are reviewing the footage of the robbery as well as testimonies of witnesses who were in front of the church as the theft was happening. Montebello told the Times that it was “only a matter of time” before the thieves were identified. “I don’t even want to think about the consequences had they not switched paintings,” he said. 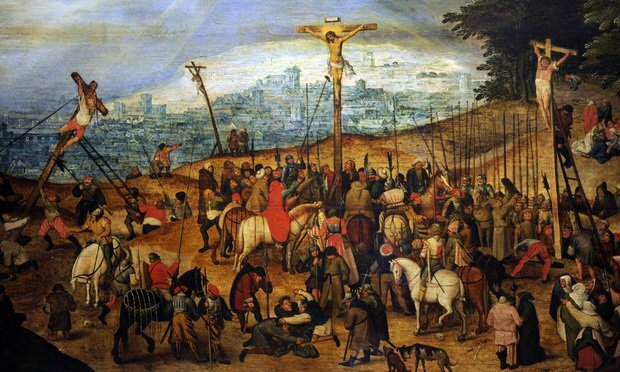 Breughel’s “The Crucifixion” is worth $3.4 million, according to Fortune magazine.